In our experience, DC-area brides and grooms all want one particular thing when it comes to their wedding photographs. Not only one thing, of course. Obviously, every couple expects their pictures to look beautiful, and every couple wants to look their best in them. We have found, however, that most future spouses also want their wedding photos to be unique. Every Washington bride and groom believes, with reason, that their love story is special in its own way. They therefore feel their matrimonial pictures should reflect that by looking like no other couple’s in the world. We agree and strive to deliver that to them when we photograph their nuptials. It always helps us when the backdrop for their Washington wedding photography is something unlike what can be found elsewhere. When the setting for a DC couple’s marriage celebration is is one-of-a-kind, the photos are certain to look special. There will be something different about them; something that captures the viewer’s attention. Fathom Gallery is a Washington, DC, area wedding venue that gives its clients this kind of setting for their nuptials. For a variety of reasons, it is nothing like most other locations in the Nation’s Capital. And as a result, the photos we take of brides and grooms there always stand out. One reason why Fathom Gallery is such an uncommon DC wedding location is because it is several different venues at the same time. And even better, it seamlessly mixes those disparate parts into a beautiful, integrated whole. For starters, Fathom Gallery resides in a building that was once a turn-of-the-century automotive shop. As such, it still retains a bit of a gritty, urban feel thanks to its use of exposed red bricks. To suit contemporary purposes, though, the interior has been remade into a hip art gallery with exquisite hardwood flooring. 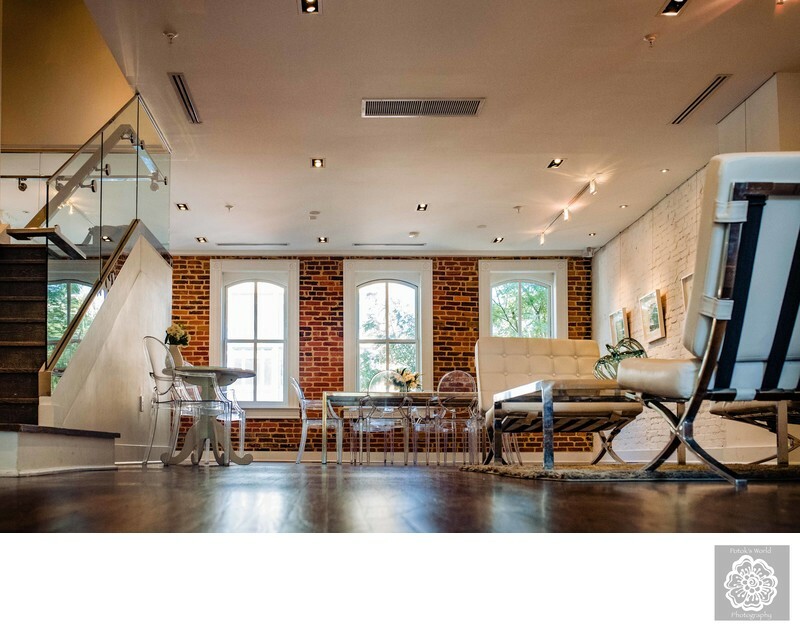 So Fathom Gallery’s indoor wedding event space contains nods to its past life within an upscale and trendy loft. To the aforementioned fashionable and urban motifs, Fathom Gallery adds a natural component with its gorgeous outdoor rooftop deck area. That particular space gives DC couples the possibility of exchanging their vows with the open sky above them and trees surrounding them. This diversity of styles and elements is perfect recipe for truly unforgettable and unique marriage photos. Over the course of a full wedding day at Fathom Gallery, DC wedding photographers can take pictures of the couple in front of several entirely different backgrounds. They can deliver to their brides and grooms images with urban, modern and natural atmospheres without ever leaving the venue. A Washington, DC, wedding photographer can also create pictures that combine two or more of the elements in interesting ways. For example, the green of the pear trees growing on the rooftop deck and the red of the brick wall can combine into a beautiful urban and natural backdrop for couples portraits. If newlyweds want to venture further afield for their portraiture, there a lot of great options within a short walk. Tree-lined Logan Circle, for example, is just a block away. In that particular historical district are several beautiful old mansions that were once home to famous Washington residents. They make for great (and very Washingtonian) backgrounds for photos of newlyweds. A walk down P Street Northwest leads to Dupont Circle, one of DC’s artier neighborhoods and a great site for portraits. Along the way, couples can stop on the tree-shaded road for expansive shots of them posing on a typical DC street. The building in Washington that houses Fathom Gallery was once an brake shop, which is evident from its exterior architecture. Like the other edifices on that block of 14th Street Northwest, it was once part of DC’s bustling Automobile Row. Though cars are no longer serviced in this part of Downtown DC, you can see reminders of the neighborhood’s former life. The building next to Fathom Gallery, for example, has a restaurant/bar in what clearly used to be a garage. A refurbished old-fashioned manually opened garage door now serves as its front window on the ground floor. 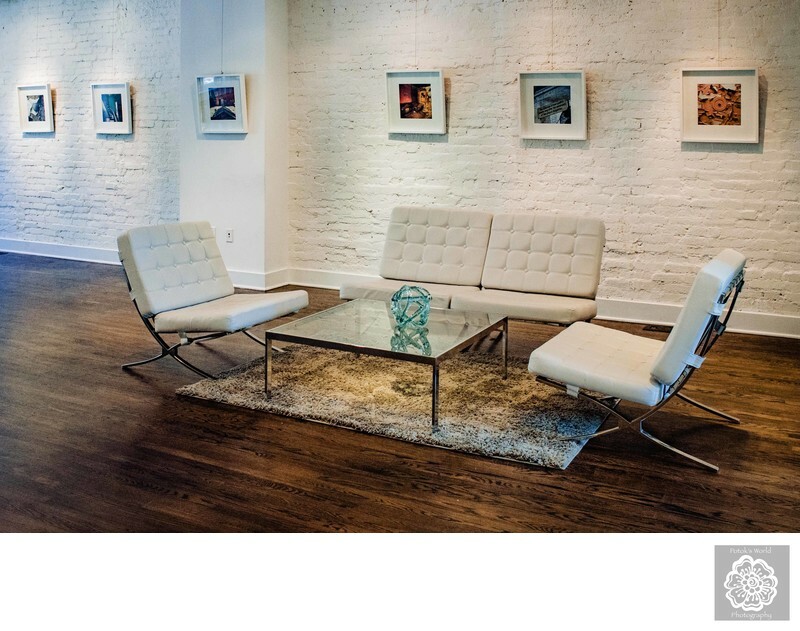 That Fathom Gallery’s DC home was once an auto repair shop is a little less apparent. The structure of the edifice still resembles that of its neighbors, of course. Many of the other elements of the garage have disappeared, though. For instance, the coffee and cocktails establishment that occupies the ground floor has replaced the garage door with a large window. Keeping with its mission to offer Washington couples a quirky space, this DC wedding venue still finds ways to embrace its automotive background. The interior, in particular, is filled with nods to its past. At the top of the stairs, for example, hangs a photo of the edifice from its Automobile Row days. 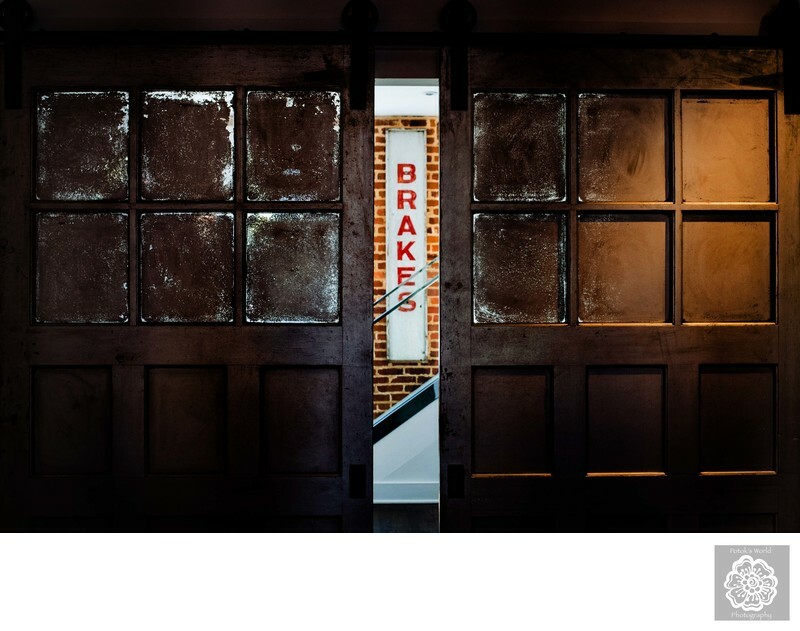 Similarly, Fathom Gallery’s kitchen is decorated with a helpful (and descriptive) vintage “Brake Shop” sign from the past. In our opinion as Washington wedding photographers, these touches effectively blend the venue’s past with its artsier present. They give their DC-based brides and grooms a lovely mix of the historical and the modern. 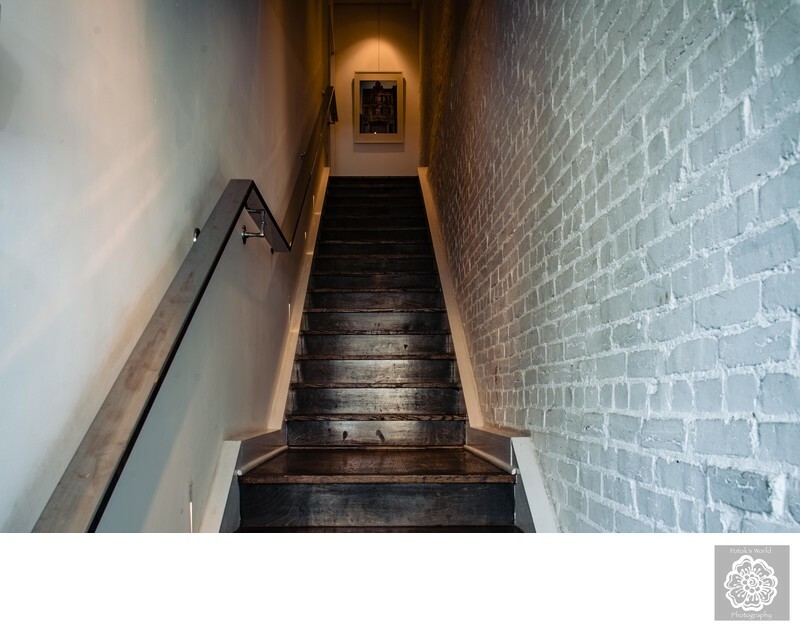 Because Fathom Gallery is a loft wedding venue, visitors who enter immediately climb a narrow staircase to the second floor. This particular space offers lovely possibilities for DC wedding photography. The leading lines created by the walls and the railing are perfect for drawing the eye to a couple. Their Washington, DC, wedding photographer can also vary up the mood of the pictures by changing where they pose the newlyweds. If brides and grooms are standing at the top of the stairs, the images appear very private and intimate. It seems like the wedding photographer has stumbled on newlyweds ducking out of their reception to enjoy some alone time. If the wedding photographer places the newly-married couple at the foot of the stairs, the effect is quite different. In those matrimonial images, brides and grooms look like they are just arriving to their wedding reception. The picture appears more anticipatory, because the couple appears to be enjoying one last embrace before making their big entrance. Turning left from the top of the stairs, you find yourself in Fathom Gallery’s main indoor wedding event space. It is an open room, measuring approximately 25 feet by 35 feet. The space can accommodate a maximum of 125 people for a wedding event. There are two things that are special about this part of Fathom Gallery for DC wedding photographers. The first is the soft natural light coming in through three tall windows at the far end of the room. It is the ideal lighting for great couples portraits. As much as flash photography is part of our repertoire, we prefer not to use it if possible. We can and do use it to inject drama into the portraits that we take. But otherwise, we will always take good natural light when it is available. And Fathom Gallery’s main interior space has plenty of it! The other thing that is great about the indoor portion of this wedding venue is how customizable it is. Though this room is furnished in these photographs, DC area brides and grooms can change it around to suit their specific needs. The open nature of the space’s design allows for many different seating configurations. If a Washington-based couple holds their wedding ceremony there, they can arrange for seating for up to 80 guests. For a sit-down wedding reception dinner, the space can accommodate as many as 65 people. Fathom Gallery’s primary indoor space is not only adaptable with regard to furniture. Future DC brides and grooms can also customize it to fit their personal tastes. The room’s white brick walls are essentially a blank canvas for Washington spouses-to-be. They can decorate them in whatever way they choose, creating a wedding venue that is completely unique to them. We especially like that brides and grooms can hang their own photographs on the walls. This creates a very cool scenario for pictures of their ceremony. Their Washington, DC, wedding photographer can get images of them walking down the aisle past their own engagement photos! It gives our wedding photography a lovely extra layer, because it highlights the progression of their journey to the altar. Opposite the three windows in Fathom Gallery’s main indoor wedding space are two sliding barn doors. Those are designed in the same distressed style as the rest of the wedding venue. 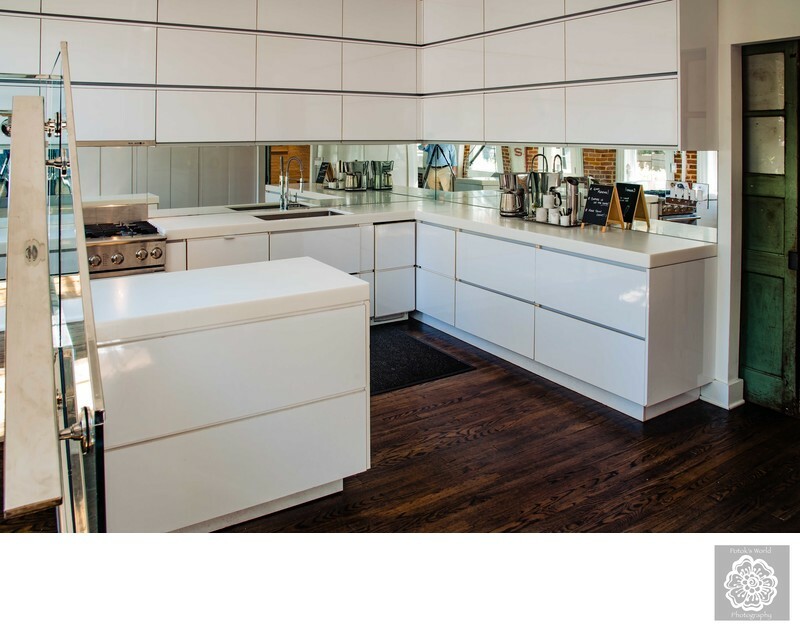 Which means that the doors fit very well with the space’s “auto shop turned chic urban loft” vibe. They also make a simple but great backdrop for couples portraits, as they are free of distracting elements. That allows the focus of the photos to remain on the newlyweds. The barn doors also provide separation between the main wedding event room and the open-layout catering kitchen on the other side. That area has two highlights, from a photographic point of view. The first is the light coming in through the windows looking out over Fathom Gallery’s rooftop deck. As in the case of the sunlight illuminating the main gallery space, the light in the kitchen is soft and gentle. You might not think that a kitchen is a good place to take couples portraits. But with good lighting, the best DC wedding photographers can take fantastic matrimonial photos in any location! The other nice thing about the kitchen is the aforementioned “Brake Shop” sign. We like it because it adds some nice context to the wedding photos that we take. It is also a quirky visual element that adds a fun little touch to the background of a couples portrait. 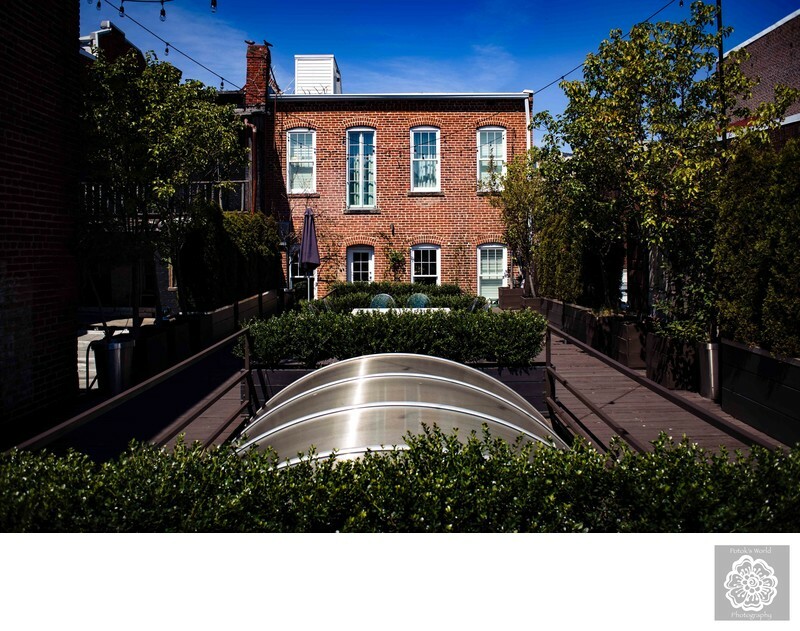 The highlight of Fathom Gallery as a DC wedding venue, in our opinion, is its rooftop deck. It is located outside the kitchen and offers Washington fiancés something that can be hard to find in the Nation’s Capital. The country’s sixth-largest metropolitan area is a great place in which to hold a wedding celebration. DC has history, no shortage of elegant wedding venues and some of the most iconic landmarks in the world. Because it is such a large city, though, Washington does not have a lot of open-air wedding venues. At least not in the downtown area. That is what Fathom Gallery’s rooftop deck so great as a site for a matrimony. It allows brides and grooms to have an outdoor wedding ceremony or reception in the middle of downtown Washington, DC. Couples can exchange their vows with open sky above them while still getting the chic feel of an urban wedding. Fathom Gallery’s outdoor space measures approximately 25 feet by 65 feet. It is large enough to accommodate as many as 125 guests at a wedding ceremony. The rooftop can fit the same number of wedding attendees at a standing, cocktail-style wedding reception. If a Washington couple wants an outdoor dinner, Fathom Gallery can set up enough tables and chairs to seat 40 guests. There are a number of things that we like about the rooftop deck as a site for Washington, DC, wedding photography. 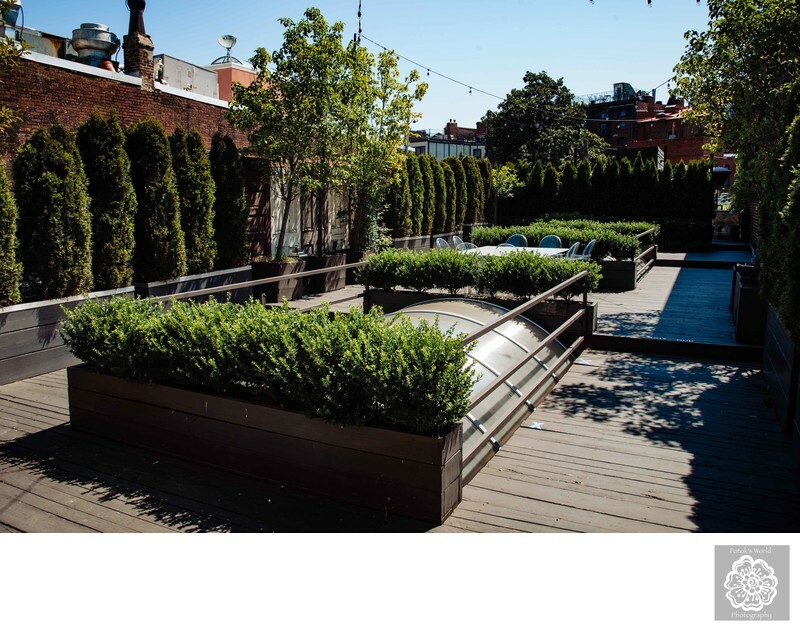 The “outdoor space in an urban milieu” atmosphere is obviously a huge selling point. The contrast makes photos of a wedding ceremony very striking and interesting. The greenery is another element that makes this part of Fathom Gallery a great location for a wedding. There are evergreen trees lining the outer edge of the deck that are interspersed with budding pear trees. The two skylights in the middle of the roof are framed by lovely shrubbery. All of this flora helps give the space a more natural feel that contrasts beautifully with the surrounding brick walls. The green of the bushes and trees also looks great against the red brick of said walls. The layout of Fathom Gallery’s rooftop deck also makes for visually interesting photos of wedding ceremony. The skylights in the middle mean that there is no space for a center aisle. Fathers of the bride must walk their daughters to the altar via one of the two lanes on either side of the roof. This creates some new and unorthodox angles for a Washington, DC, wedding photographer. And that leads to more creative and memorable wedding pictures! Fathom Gallery also has a penthouse upstairs from the main gallery space. The penthouse was in use on the day we took pictures of this DC wedding venue. It consists of two adjoining rooms that can be used for bridal prep, a photo booth or extra seating for a wedding reception dinner. The larger of the two is about 17 feet by 20 feet, whereas the smaller is approximately 9 feet by 13 feet. The penthouse comes equipped with a shower and anything else that a bride would need to get ready for her wedding day.